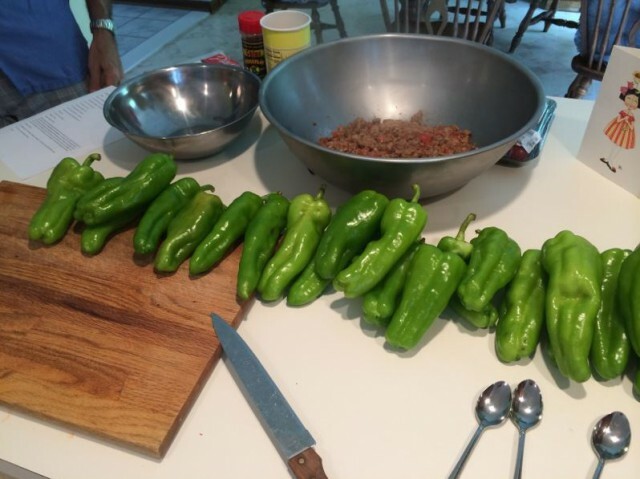 We might be biased, but this stuffed pepper recipe from our Dad might literally be the best summer dish in the entire world. The easiest way to serve and cook these is to prep the peppers and stuff the day before, leave in the refrigerator (covered in plastic wrap) and then take them out of the fridge 1 hour before grilling the next day, to get to room temperature. 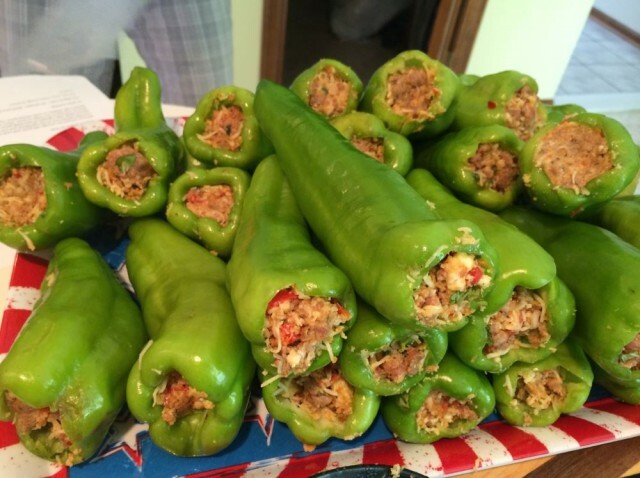 Only brought out for special family occasions, Ken’s Hot Stuffed Cubanelle Peppers are a crowd favorite and best served grilled in the summer time, surrounded by your favorite people. 14 Italian Sausages (with casing removed) — we use hot Italian sausage for a little heat, but feel free to use your favorite style. Prep-work: Hallowing out the Cubanelle Peppers so they are ready to stuff, easily done with a small pairing knife to get rid of the seeds and insides. Be careful as to not cut through the sides of the pepper. You’re going to make sure those are solid so nothing delicious falls out while grilling. To begin the sausage mixture for stuffing, start by removing the casing from sausage, add the garlic and cook on a stove top pan until cooked-through. Follow up by draining the cooked sausage on paper towels to remove any excess liquid. 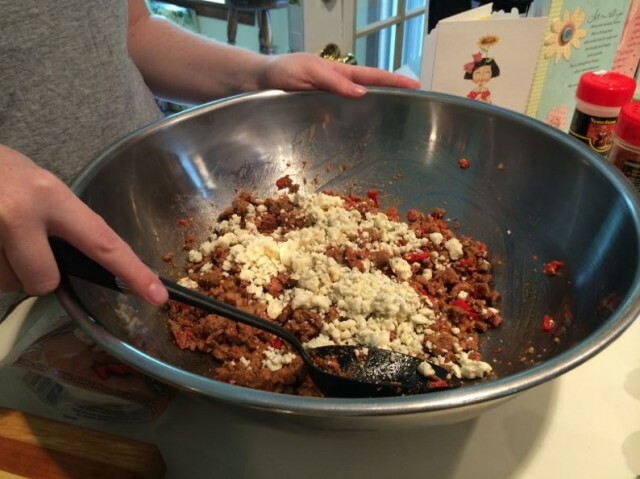 Combine the remainder of the ingredients into a large mixing bowl (Parmesan cheese, bread crumbs, red pepper, feta cheese, mozzarella cheese, dry rub spice, black pepper, cayenne pepper, basil) and add the cooked sausage and garlic. 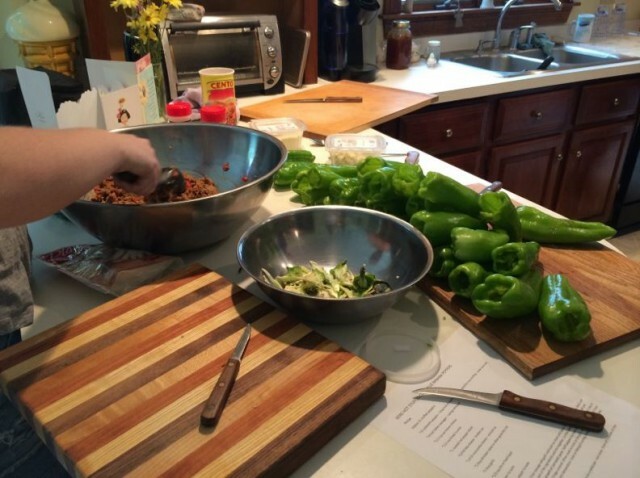 Once the mixture is set, you will be stuffing the peppers by hand. Our trick, to have one hand in a disposable plastic glove (to grab the stuffing) and the other free hand to hold the peppers. Since you’ll be grilling these, it’s best to not over-stuff. Just put as much filling as will allow and leave a little room at the top. When grilling, the stuffing will move around a little, cheese will melt and you’ll want a little wiggle room. If you’re grilling the next day, wrap up these beauties (plastic wrap or any loose cover should do) and place in the fridge overnight. The next day, take out of the fridge 1 hour before grilling to get them to room temperature before placing on the grill. This will prevent the center of the pepper from staying too cool, while the outside of the pepper cooks and chars up a bit. 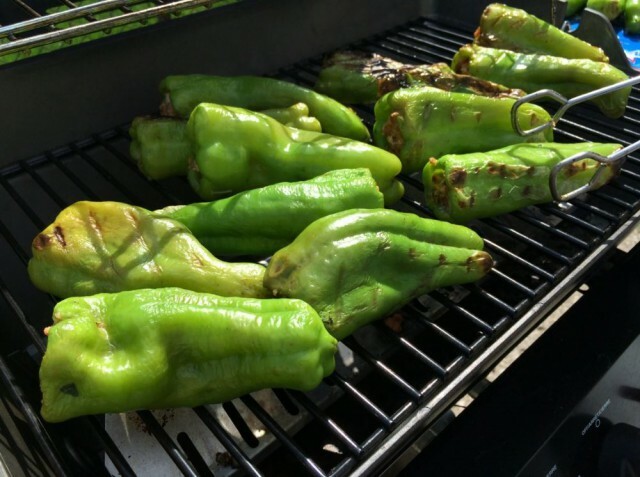 Place these babies on the grill and cook through so the pepper is hot on the inside. Some grill marks on the outside only make it taste better, and don’t worry about cooking the meat through, you already did that yesterday. Serve up and enjoy. 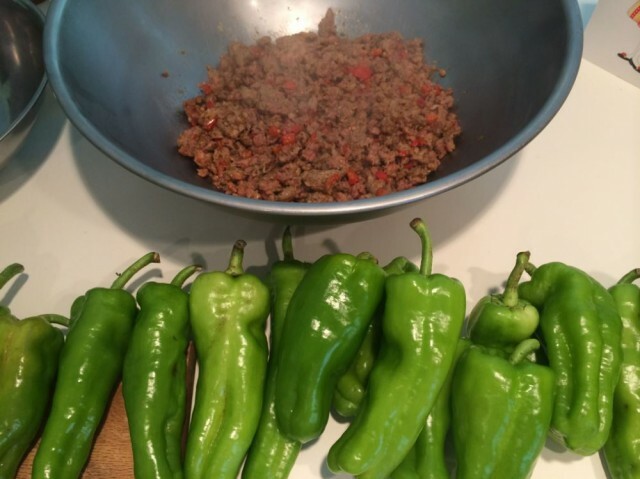 One veteran tip too, save five of so peppers after stuffing and place them in the freezer for later. You won’t regret it. Happy grilling! 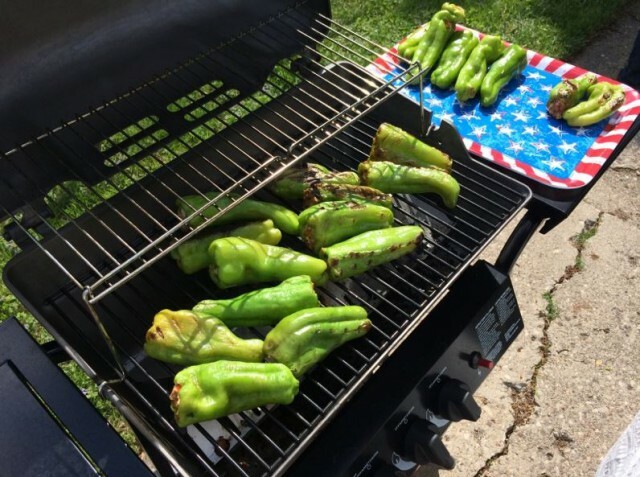 Other option for baking (instead of grilling): Heat oven to 375 degrees, and place stuffed peppers on a metal pan to bake for 25 minutes, turn them over once to even heat. Then finish them off in the broiler for a few minutes to char at the end. 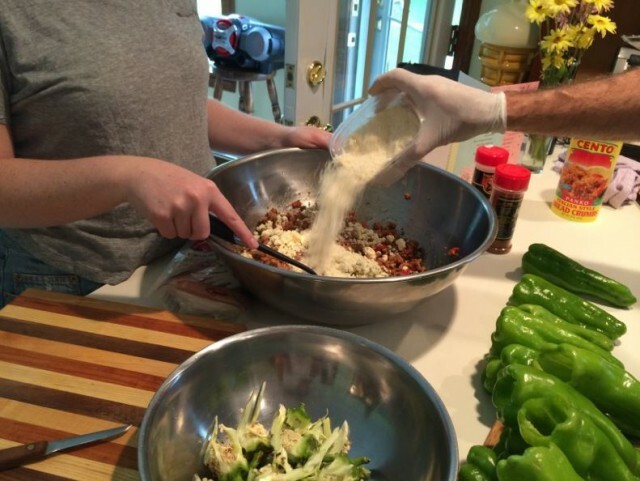 Tags: Banana Peppers, cheese, Chef Ken, Cubanelle Peppers, Feta, Grilled Peppers, Grilling, Italian Sausage, mozzarella, Parmesan, peppers, recipes, ROOKIE CHEF, Stuffed Peppers, Summer dish. Bookmark the permalink.